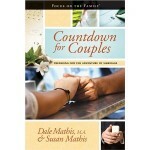 Dale and Susan are authors of Countdown for Couples: Preparing for the Adventure of Marriage. Dale has two Master’s degrees in counseling and has worked in counseling and Human Resources for over 30 years. Susan is the Founding Editor of Thriving Family magazine, the former Editor or Editorial Director of 12 unique Focus on the Family publications including the Focus on the Family magazine and the Focus on Your Child newsletters. She has also written hundreds of articles and columns for magazines and newspapers. Dale and Susan have worked with couples in premarital counseling and are mentors and facilitators for the Woodmen Valley Chapel Premarital class. Available on CBD.com and Amazon.com. Can remarriage really work? Yes, if you prepare for it and learn keys to doing it well. As a remarried couple, we know that you are looking for real and practical answers to build a successful marriage, alleviate your fears and anxieties, and have hope for the future. We understand. We are there, and we want to help you navigate the many joys and challenges of remarriage. And we believe that knowing God’s plan for forgiveness, healing, and redemption in your marriage is foundational to finding true fulfillment. Written especially for couples who have lost a marriage through death or divorce, we will help you learn, not only about each other but also about your relational skills and compatibility as a couple. Each chapter includes a special sidebar called “Blending With Kids” that will address blending family challenges unique to couples who are remarrying with children still at home. This easy-to-read premarital guide will help you as individuals and as couples. It will also help pastors, counselors, small groups, and/or premarital classes prepare couples for the adventure of remarriage. Before you jump into this new life together, learn how to make your marriage strong—and ready for the days ahead. Isn’t it great? The thought of marrying the one you love; the ecstatic feelings of sheer happiness; the excitement of planning a wedding and counting down the days. But wait! There’s all that other stuff—the “for better or worse, for richer or poorer, in sickness or health, till death do us part”—the reality of daily living together stuff. Marriage is a huge commitment and not one to be taken lightly, so you’re wise to assess and learn all you can before your big day. Countdown for Couples will help you do just that. We’ll review the basics, but we’ll also go deeper and address things you may never have thought you needed—or wanted—to know or talk about. If you view premarital preparation as a countdown to an adventure, a journey deeper into the life of the one you’re planning to marry, it’ll be one of the most exciting and important things you’ve done together so far. Research and common sense indicate that engaged couples will have stronger, more successful marriages if they participate in premarital counseling. Countdown for Couples addresses the issues of greatest interest and importance to engaged couples, delivers this insight in an easy-to-use format, and tackles many important questions. Before you begin the adventure of marriage, open the map and see where you’re going. 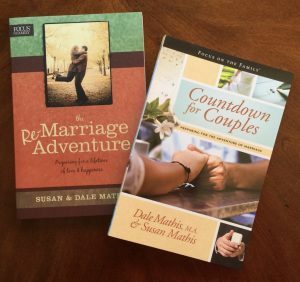 “The Remarriage Adventure is an invaluable resource for couples who are setting out on the journey of remarriage and blending families, as well as for pastors who increasingly require insight into their unique challenges. The power of coupling their own story with those of others enables Dale and Susan to offer biblically practical wisdom from a foundation of compassionate understanding. Highly recommended!”—Grant R Walton, Senior Pastor, New Creation Family Church, Johannesburg, South Africa. “The high divorce rate of couples who remarry is about to drop. . . dramatically. The Remarriage Adventure is a thorough, intensely practical, biblical, hands-on guide. If you want a successful remarriage—and of course you do—you must get this book.”—David Clarke, Ph.D., Christian psychologist, speaker, and author of Married. . . But Lonely. “As in the reality show called ‘Wipe Out’, the complexity of obstacles like finances, blending children into a new family, in-laws, and healing from past wounds can make the average remarried couple feel like they are one step away from a huge wipe out! Fortunately, Dale and Susan Mathis have written a wonderful resource to help you navigate this obstacle course with biblical principles and practical advice. Most importantly, their emphasis on the redemptive love of Jesus Christ is the signpost that will encourage you through the most difficult of circumstances.”—Dr. Juli Slattery, author of No More Headaches and Finding the Hero in your Husband. “Countdown for Couples is a gold mine of information! It’s packed with wonderful, practical ideas for couples looking forward to their marriage ceremony. In our case, it deepened our relationship after being married for 25 years!”—Alice S.
“Dale and Susan ask all the right questions in their book, Countdown for Couples.Engaged couples—and newlyweds—can learn to communicate about the practical and personal areas of their married life.”—Johanna P.
“I’ve read a number of marriage, and pre-marriage resources, both for my job and for my own personal life. This book really covers it all–it talks about the really important issues like communication, finances, religion…but it also has a lot of fun stuff too. The discussion questions provided some great ideas for getting to know my fiance’ a lot better.”—Christina G.
“Countdown for Couples a strategic read. From concepts such as ‘recognizing red flags,’ to meeting each other’s needs, to budgets and fighting fair–this book provides invaluable insights not only for couples considering marriage but also for those who interact with them. In fact, those who are struggling in their marriages might even use this book to find a better way of interacting. The exercises in each chapter could help develop a whole new level of intimacy.”—Patti T.